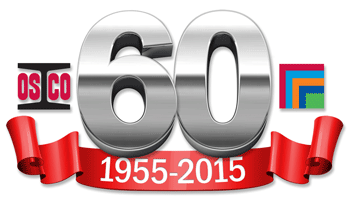 2015 marked the celebration of 60 years in business for Ocean Steel and the OSCO Construction Group. What began in a humble 45' x 120' wooden building in Saint John, New Brunswick, has now grown to encompass over 20 locations in Atlantic Canada and the Northeastern United States. What began as a local operation to modernize and expand a pulp & paper mill, has now completed projects as far west as Alberta; as far east as Africa; and as far south as Bermuda. What began with the vision of two men; K.C. Irving and Hans W. Klohn; now employs over 1200. To mark this milestone, a timeline was produced for our corporate magazine, providing a brief journey through OSCO’s last 60 years. It illustrates not only how it was all made possible; but most importantly; how a strong foundation has been laid for the next 60 years. We hope you stick with us for the ride.